Maximization of sales is the primary business objective, for which various strategies are followed by the company. One of those strategies is providing a discount or rebate to the shoppers to induce them buy more quantity of goods. The discount is a most common strategy used by the entities to enhance its sales, in which a deduction is made in the price of the product. On the contrary, the rebate is a particular kind of discount or say partial refund of the product price by seller to the buyer, allowed to those customers whose purchases reach the specified volume or quantity. Whenever, people get a reduction in the price at the time of purchases, it is a discount, but in reality it is rebate. 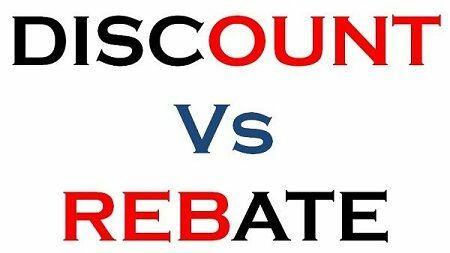 So, every customer and seller, must be known about the differences between discount and rebate. Meaning A deduction in the purchase price given to the buyer, by the seller for various reasons, is known as discount. The rebate is the amount of the purchase price refunded by the seller to the buyer, when the quantity purchased reaches the specified limit. When is it provided? When advance is paid or payment is made in time. At the time of making full payment. Given on Each item purchased by the customer. Only if the value of goods or quantity purchased reaches the specified limit. The concession allowed by the seller to the buyer on the par value of the invoice is known as Discount. It is given on the gross amount of the product, and the buyer has to pay the net amount of it which is equal to gross amount less discount. Trade Discount: The discount which is allowed on the list price is known as Trade Discount. It is given to all the customers, whether they are making credit purchases or cash purchases. It is allowed to the customers to encourage sales in large quantities. The rate of discount varies according to the order placed by the customers. Cash Discount: The discount which is allowed to the customer only if he makes a cash payment for the items purchased is known as Cash Discount. It is granted only to the customers who makes immediate payment. The discount is shown in the books of accounts. The rebate is a type of allowance provided to customers on goods purchased as a deduction in the catalogue price and to the assessee for tax paid or to the tenant for rent paid for the amount paid more than the amount needs to be paid. The rebate is allowed to customers, when their purchase in quantity or in value, reaches a specified limit. The amount returned to the buyer by the seller, at the time of making complete payment for the purchases is known as a rebate. It is a tool used by the sellers to promote sales in large quantities. The amount of rebate provided to the buyer is pre-decided by the seller. The rebate is also allowed to the assesses if they pay taxes more than the amount to be paid. It is the money refunded by the tax authorities to the assessee. Similarly, in the case of rent and utility bills, the rebate is allowed. The discount is a reduction in the face value of the goods allowed to the customers for making payment in stipulated time or purchasing products in big lots. Rebate, on the other hand, is a special kind of discount allowed to the customers when the purchases made by the buyer crosses the defined limit, in the specified period. The discount is a marketing strategy, but Rebate is a sales strategy. Discount is allowed when the payment is made in time, whereas rebate is allowed when the full payment is made to the seller for purchases. Discount is available to all the customers. Conversely, Rebate is available to those customers who fulfil the specific criteria. Discount is given for each item purchased by the customer; however, the rebate is given as a deduction in the list price provided the required conditions are satisfied. Therefore, from the above discussion, it is quite clear that the discount and rebate are two very different things. Discount is a very common tool for raising sales. It is frequently given to the shoppers, to retain them for a long period. Rebate is occasionally given, only to those customers, which fulfils the specific criteria. So, the rebate is not open for every person, but the discount is available to all the customers. Thank you for all these definitions.All these definitions are very clearly defined and easy to understand. Also, it would be even more great if you can elaborate them by giving some examples along with these definitions. But overall it is worth reading.